In 1980, Dr. Ellington Beavers ’93H was about to turn 65, an age when many enter into or contemplate retirement. The company for which he had worked for 40 years, Rohm and Haas, had a policy of compulsory retirement for chemists employed as long as Dr. Beavers was. But he was by no means ready to stop. Dr. Beavers wrote to the presidents of Beaver College, Gwynedd Mercy College, and Temple University—three institutions within commuting distance from his home in Meadowbrook—and offered to make himself available, without compensation, if his laboratory expertise could be useful in some capacity. Beaver College’s president at the time, Dr. Edward Gates, asked Dr. Beavers to meet him for lunch at The Union League of Philadelphia. Shortly after, President Gates asked Dr. Beavers to join the College’s Board of Trustees. For more than two decades, Dr. Beavers, who died in 2015, worked with Arcadia students and Chemistry professors in Boyer Hall’s laboratories. In 1991, Dr. Beavers founded Biocoat, Inc., a global medical device coating company. Fifteen years later, when the company’s work became more than the facilities in Boyer could accommodate, Biocoat’s operations moved to Horsham, Pa.
And, nearly 40 years after that initial meeting, Arcadia University is the recipient of an $8.6 million gift, the largest single gift in the University’s history, with the December 2018 acquisition of Biocoat by 1315 Capital. The proceeds from the acquisition were realized through the University’s ownership of 16 percent of Biocoat, shares which Dr. Beavers gifted to Arcadia when the company was founded. There is no ideal Beaver College student. There is an ideal Beaver College for [every] student. Today, Biocoat’s research and development facilities are state-of-the-art. The company licenses hydrophilic coatings for devices used in a range of medical practices, including ophthalmology, cardiology, and neurovascular surgery (see “Hyaluronic Acid”). By the fall of 1984, the year he became chair of the Board, Dr. Beavers had organized and made Boyer 327 the hub of his operations. He established a controlled “cleanroom” down the hall to prevent contamination and helped institute protocol for safely disposing chemicals—efforts that contributed to the department’s accreditation by the American Chemical Society in 1995. Limited resources meant greater opportunities for problem-solving. And Dr. Beavers loved a challenge—particularly when it meant putting student innovation to the test. Over the 22 years Dr. Beavers spent in Boyer Hall, he and his team employed more than 60 students on a part-time basis. He prided himself on the work he did in chemistry, but he was so much more than a chemist. He was an industrious person [and] a generous and intelligent man. Their early experiments with biomaterial coatings were met with obstacles; namely, the Boyer labs weren’t equipped to handle the quantity they hoped to test. Relying on his connections in the field, Dr. Beavers facilitated the installation of a wooden curing oven that accommodated up to 20 coated catheters in room 305. An exposure rack was built on the roof of Boyer to test ultraviolet light sensitivity. A system of pulleys and fishing lines—designed to expedite the tedious coating process—was implemented by Dr. Beavers, who dipped into his fly-fishing knowledge until an electric apparatus was installed in room 18.
a nonprofit subsidiary that grew into Beacon Research, Inc. He agreed to share profits from revenue-generating products with the College, provided that a portion of the funds be set aside for chemistry equipment. In the labs, Dr. Beavers’ team expanded their research on hyaluronan coatings, developing applications for optical lenses, automobile windshields, condoms, non-fogging bathroom mirrors, surgical blades, submarines, torpedoes, stents, bandages, and fire hoses. They even discovered a method of controlling the invasive zebra mussel population by making ships too slippery to attach to. Biocoat’s inception on Nov. 1, 1991, was the first step toward this goal. Beacon operated concurrently until 2006, when the Food and Drug Administration pressured Biocoat to absorb all research activities and relocate to Horsham, Pa. But despite the FDA’s stringent requirements, Dr. Beavers’ work in Boyer’s evolving laboratories led to 11 patents and numerous patent applications. This was, by his own admission, the worst question Dr. Beavers could ask himself. Described by colleagues as a southern gentleman, Dr. Beavers matched his mild-mannered nature with insatiable drive. At various points in his Rohm and Haas career, he served as corporate vice president, senior vice president, and group vice president and sat on the Board of Directors. Co-founder Otto Haas even charged Dr. Beavers with scouting locations for their elite research facility, appointing him director of research—a position he served in until retirement. Dr. Beavers governed his health as methodically as he conducted scientific investigations. He eschewed foods high in fats for healthier cuisine, exercised at fitness centers regularly throughout his life, and even completed two marathons. Kathy Mackin Sweeney ’81, a Beaver College alumna who interviewed Dr. Beavers just after he was appointed chair of the Board, described the then-68-year-old’s routine: wake up at 6 a.m., jog two miles, squeeze in a gardening session, and hit the labs by working hours. Though quiet and pensive, Dr. Beavers stood out as a leader; more often than not, his peers wasted no time in naming him such. When Dr. Beavers was introduced to the Board, fellow trustee Dr. Gregory Halpern ’73H—who later served as a Beacon Research consultant—almost immediately recognized his inquisitiveness (Dr. Beavers’ preferred after-dinner reading was, after all, organic polymer research). In those first few meetings, Dr. Halpern helped lay the groundwork for hyaluronan coatings while brainstorming contact lens alternatives with Dr. Beavers. As a trustee, Dr. Beavers’ community involvement was second to none: from establishing a group of local leaders and industrialists to ensure Beaver College was a recognized name, to spearheading hands-on fundraising campaigns that issued a wave of scholarship on campus. Showcasing his generosity, Dr. Beavers also gave more than $218,000 to Arcadia during his lifetime, including matching gifts from Rohm and Haas. But his true verve for life was nurtured in the solitude of Boyer 327. In 2007, when asked what his goal was for Biocoat, Dr. Beavers imagined the mom-and-pop operation becoming “a major participant in world commerce, providing products and services of reliable merit, opportunity, and security.” From day one, his target was bigger than Boyer Hall. But the modest, resourceful innovator knew he could set a global enterprise in motion by listening, collaborating, and making the most of his labs in Glenside. Ellington demanded excellence, had a thirst for knowledge, and was passionate about helping mankind. 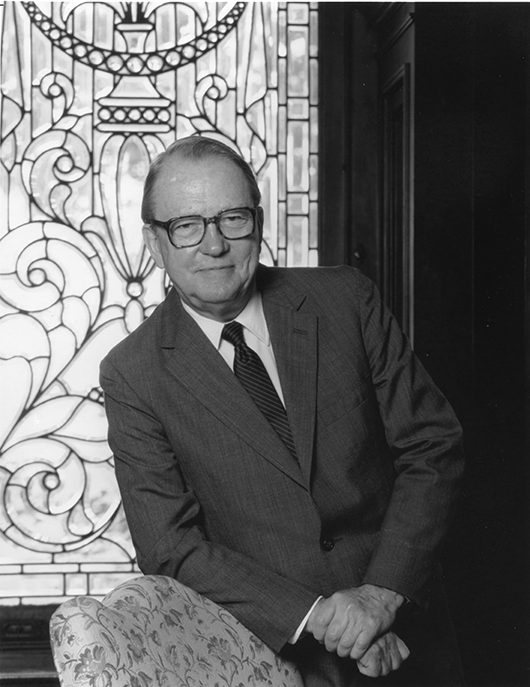 After Dr. Beavers’ tenure as Board Chair ended in 1989, a fund was established in his name to support research initiatives led by faculty and, later, students. Aligned with his commitment to pushing boundaries across disciplines, the Ellington Beavers Fund for Intellectual Inquiry enables scholarly and creative discoveries that might otherwise remain unexplored. Imagine introducing steel wire to the bloodstream. Disrupting the body’s ebb and flow with a vascular catheter. Implanting a metal mesh stent. These are necessary steps for unclogging arterial plaque, but at any point in this process, the body might reject and attack the foreign instruments. That’s where hyaluronic acid—a natural lubricant found in body tissue, saliva, umbilical cord, even rooster combs—comes in. When combined with polymethyl methacrylate—otherwise known as plexiglass, Rohm and Haas’ speciality—hyaluronic acid is perfect for coating medical devices, from catheters to guide wires, as the body recognizes the lubricious, abrasion-resistant polymer as a natural substance. Biomaterial coatings are easily accepted by delicate vascular channels, reducing risk of blood clots and surgical complications and providing patients more comfort. As you read this, theories rooted in Dr. Beavers’ legacy are being tested, refined, and shared far beyond the third floor of Boyer Hall—beyond even Arcadia’s campus. In the Health Science labs, 2018 fund recipient Jacqueline Neminski ’19M—aided by Associate Professor and Director of Genetic Counseling Dr. Laura Conway ’99M—is designing educational resources to simplify and communicate disease-causing variants that pop up in genetic screenings, but are unrelated to a patient’s initial need for testing. By experimenting with a range of visual and text-based media, Neminski hopes to illuminate the importance of secondary findings in disease detection and to shed light on the relationship between health literacy, education, income, and age. Dr. Beavers’ quintessential university provoked curiosity and fostered exploration. Even today, his gifts work toward that paradigm, giving budding researchers what Beaver College gave him nearly 40 years ago: a chance. While Dr. Beavers’ gift comes as something of a serendipitous gain for the University, it is emblematic of a recent rise in fundraising at Arcadia. As of February 2019, giving totals are up by nearly 10 percent over this time last year, notwithstanding the aforementioned $8.6 million. The number of pledges are up, and members of the Board of Trustees collectively pledged $600,000 at President Ajay Nair’s inauguration in October to support presidential initiatives. The Biocoat gift will be invested in a quasi-endowment, with the interest to be used to fund initiatives established by Arcadia’s forthcoming strategic plan. The gain stands, in a way, as an ideal representation of the innovation and vision that Arcadia hopes to instill and encourage in students, faculty, and community members.